When we create a new drafting view we are presented with an empty view. We are free to begin our drafting exercise anywhere we see fit. It's not obvious but there IS an origin in the view. 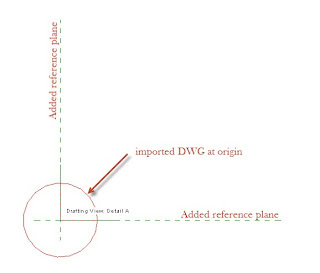 If we import a simple CAD file that has some lines that define where the 0,0,0 origin is we'll find out exactly where the origin is in the drafting view (use Auto-Origin to Origin). What does it matter? It may not matter at all. I've often wondered about it since Revit cares about keeping us near the origin of the file for our model views and complains when we import external files that are very far from origin or very very large. As such I can't help but wonder if we ought to be careful to keep our details near the origin of drafting views too. I have encountered drafting views that have their contents very very far from the origin. It's easy to do, just zoom out a bit and start detailing. It just seems inconsistent with the best practice expectations for model views. I'm inclined to create a "template" drafting view in a project template to begin drafting views with (duplicate them) with the origin clearly marked, like shown above. I'd welcome someone from the factory chiming in to say this is a good idea or unnecessary. might be nice to have a detail module guide aligned to the drafting view origin as a seed view in the template. I agree with you Steve! Maybe it's obsession, but at least I like to set guidelines such as what you describe so you have consistency. I made this suggestion back when I was at my first employer and we were working on making Revit drafting views for our typical CAD details. I suspect that the file origin and drafting view origin are one and the same. If so it probably does matter that we keep details nearby. 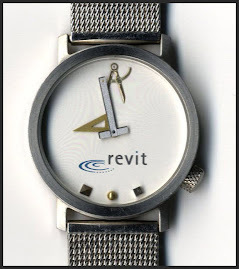 I tried just typing in 0,0 to see if my curser would jump to the origin...nope But revit opens the import cad window. Nice shortcut but not what we really want to do.